Elizabeth Pandolfi on the pleasures and dangers of a town made of tea @ Anderbo. Munnar. A town in Kerala, the only Communist state in India. 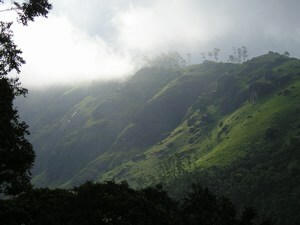 Indians call Kerala “God’s Own Country”; if this is true, then Munnar is a new kind of Eden. You will find it high in Kerala’s mountains, an unending, undulating expanse of green, leafy vastness. This town so close to the sky is a world of soil and air, grown up into tea plantations. When the sun shines, the millions and millions of tea leaves smolder and glow with a cool, ancient radiance; but when the sky turns gray and white, when clouds descend onto the mountaintops in wisps and puffs of fog, that is when the leaves betray their hidden selves. In the soft gloom, you see them for what they truly are: ghosts; conjurers of forgetting, of delicious, tempting, loss. Munnar is a beautiful and dangerous place, a lovely Medusa: one look, and I froze into stone. The mountains. If you have never seen tea, imagine fresh-picked tobacco. Tea is just as green and just as thick, but on a smaller scale. Tea plants come up to your thigh or waist, with leaves about half the size of a young girl’s palm. They grow on mountainsides, steep and rocky. The plants are dense, dark chlorophyll green, with leaves that look like they’re breathing. Those leaves are so numerous that they seem to be multiplying: growing before your eyes. When you walk along the roads that lead into or out of the tea plantations, they might reach out to surprise you out of your stone-stupor, to call you back to life and breathe some of theirs into you. You would come home from your walk smelling like rain and soil, slightly green on your fingers and toes. You would notice an increased sensitivity to sunlight. Washing your hands with clean, cold water would be a sensual experience, one that required several slow minutes now, instead of the usual quick seconds. When you got undressed for bed that night, you would see the green climbing up your legs, and in the morning there would be little of you left. What could you do except go back to the tea fields, leave the path this time, wander through the knee-high forest feeling how silky those leaves were, until finally you lay down to sleep. You wouldn’t wake up; wouldn’t return.